Having reason last Saturday to go up to Lockhart, to participate in an evening fund-raising event to support the Eugene Clark Library, my daughter and I thought; let's drive up in the early afternoon and take a look at the sights of historic downtown Lockhart; a district of several blocks centered on the archetypal Texas courthouse in a square with a number of businesses housed in classic late-19th century or early 20th century buildings. It's a short drive from our San Antonio home, all things considered, and a fascinating place to spend a weekend afternoon. We would hit a couple of thrift and antique shops, check out one of the four notable BBQ houses, and generally have a relaxing afternoon. 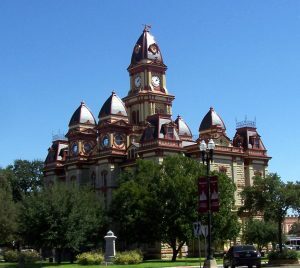 Lockhart is a mere hour and a bit drive away: up IH35 to San Marcos, as if going to Wimberly, but instead of turning left and going through downtown San Marcos and past the university, turn right and just carry on until a left turn on Hwy 142, which leads straight into the heart of lovely downtown Lockhart. 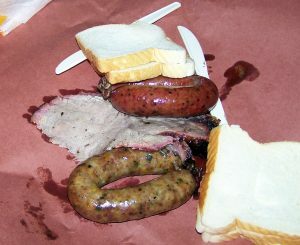 We chose BBQ at Kreuz Market for lunch, which was good, if not quite as sublime as we had expected. The side dish beans were excellent, and the hot German potato salad had an admixture of sauerkraut in it – very tasty. Afterwards, people told us we should have gone to Blacks, or Smitty's. The first rule of road-food: always go where the local people say they go. 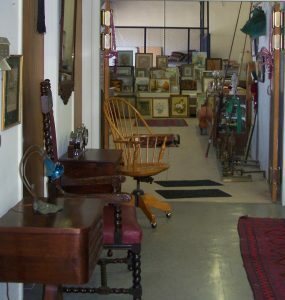 We were also referred to the Main Street Gallery, which is set up in a lofty old building which the owner, Johnny Lay, explained had used to be a stable. 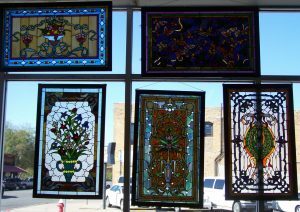 Now it is fully stuffed with lovely antique furniture, stained glass panels that my mother, the stained glass hobbyist, would give her eyeteeth to be able to replicate. There is a case of Civil War era tintypes and daguerreotypes, most of them just the size to fit into a pocket, and some really splendid art glass. There was also a long shelf of books; among the few things that I could afford. This is one of those antique shops which I would love to furnish an entire house from, once I have become a very rich and famous writer. (The other is Back Alley Antiques, in Artisan's Alley here in San Antonio). We finished up at the Southwest Museum of Clocks and Watches, open on Saturdays and by appointment; which guided tour was a great deal more fun than most guided tours usually are. 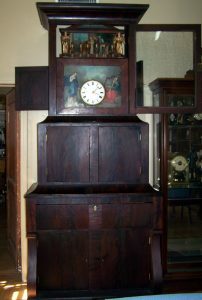 The single most amusing item in the museum is a concoction of dark mahogany which once belonged to showman PT Barnum: A clock-desk-music-box-organ, which was stored in a local barn for nearly seventy years and restored by the museum staff. They also have the original works from the clock in the tower of the courthouse . 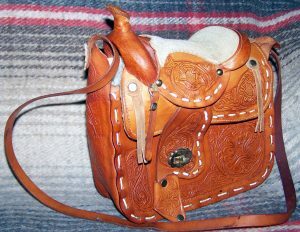 . . which has also been recently restored. It's a short drive from our San Antonio neighborhood, all things considered, and a fascinating place to spend a weekend afternoon.